What is Node.js and Why Should I Care? There are three main reasons why I’ve chosen to learn about Node.js right now. Now that Node.js is starting to show up seemingly everywhere (everywhere I spend my digital time anyway), I am compelled to really dive in and learn about this rapidly advancing platform. In my search for answers I came across this great post on Mozilla.org. This information brings up an important question: Isn’t it a bad thing to have a single threaded application server if you want high scalability? I had to do more research. This realization raised a question in my mind: Is it better, faster, or more scalable to use event-driven programming instead of multi-threaded programming? As it turns out, trying to answer this question is like falling down a never-ending rabbit hole. There are a ton of arguments on both sides and nothing that swayed me in either direction. It seems like one of those choices where you use what works better for your circumstance. Sorry, but you’ll have to figure out whether multi-threaded or event-driven is better for you on your own. I’m going to have to trust that it is lightweight and efficient since I am not a developer but the last part of the definition (distributed devices) has me asking another question: How do you scale a Node.js application? Distributed implies a horizontal scaling methodology, and as we discovered earlier Node.js is single threaded so it can only use 1 CPU at any given time. 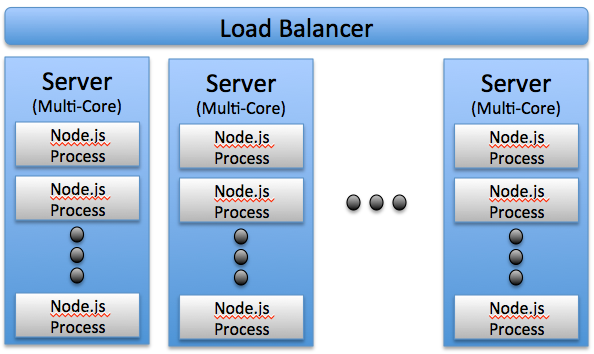 How do you scale Node.js is the real world when you have a massive spike in workload? I found my answer in this excellent blog post . I’ll summarize here: Node.js has functionality you can use to have multiple processes listen on the same port. Each individual process can use a single CPU so you can scale out a multi-CPU server by using multiple processes. You can also take advantage of scaling across multiple host by using a reverse proxy, load balancing web server. This is more traditional clustering so it should be familiar if you have experience running distributed applications. Another important part of scaling Node.js is making sure you use Node to only server the dynamic content while offloading static content distribution to either a web server like nginx or by using a CDN. There seem to be many success stories out there for Node.js, but like with any technology it must be applied properly. Just like every other programming framework there will be efficient code and poor performing code. Anyone using Node.js will eventually need to troubleshoot their application(s) for performance and scalability issues and that is where Nodetime comes into play. If you’re currently using or are planning to use Node.js for an application you should either read this blog on monitoring Node.js or just jump right over to the Nodetime website and start your free trial today.